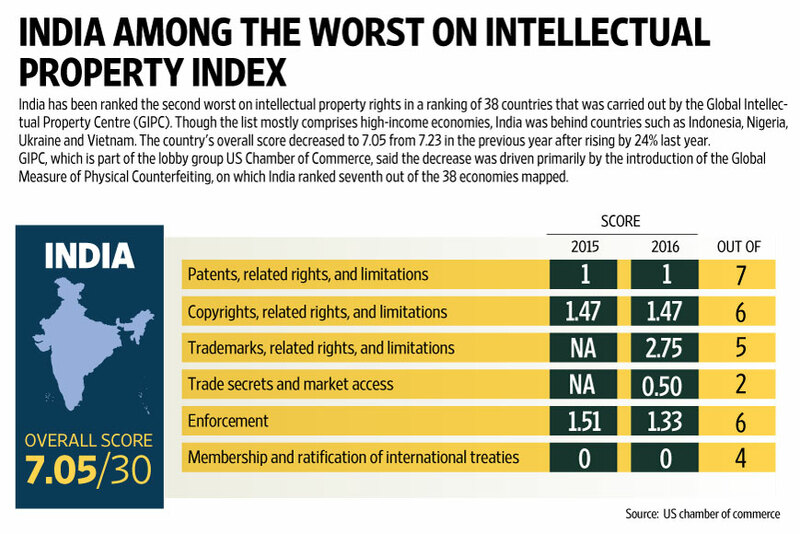 Annual International Intellectual Property Index released by US Chambers of Commerce’s Global Intellectual Property Center (GIPC), India has been ranked very poor at 43rd position out of 45 countries. The 2017 International Intellectual Property Index titled ‘The Roots of Innovation’ revealed that though India showed slight improvement its performance, still it continued to lag behind the rest of the world in IP protections. Out of a total of 35 points, India could score only 8.75, even below the average score of 15.39.The Index has been topped by United States with a score of 32.6. This is for the fifth consecutive year that India has been ranked at the bottom in the index. It was ranked last or next-to-last in the previous four years.Last year, India was placed 37 out of 38 countries and scored a low 7.0 out of maximum 30 points. The report said that though India made some increment this year, but the Indian government has to do a lot more to build up a positive impression of its IPR policy with adequate legislative reforms that innovators require. The report stated that the slight improvement in India’s overall scores is mainly because of the inclusion of five new indicators in the index on which India performed very strong. According to the report, India scored little better than before due to the newly adopted National IP Policy that recognises several key gaps, including the need for a stronger enforcement of the current IP rights. However the policy does not address the challenges and uncertainties rights-holders face when it comes to protecting their patent rights, modernising existing copyright laws or introducing international best practices and new sector specific IP rights such as regulatory data protection. Besides, India’s anemic IPR Policy, the report cited challenges with the scope of patentability for computer-implemented inventions, Section 3(D) of the Indian Patent Act, and the recent High Court of Delhi decision to permit photocopying of copyrighted material for educational purposes. Besides, India, Pakistan ranked at 44 position with 8.37 score which was added in 2016 in the index along with Venezuela. China scored 14.83 points. This year seven new countries have been added to the Index. They include Egypt, Hungary, Kenya, Pakistan, the Philippines, Saudi Arabia and Spain. According to the report, the 45 countries analyzed in the index represent nearly 90% of the global economic output. The Intellectual Property Index was started in 2012 US Chamber’s Global Intellectual Property Centre (GIPC). The index is based upon 35 parameters each having one point weightage. Some of the aspects are patents, copyrights, trademarks protections, trade secrets and market access, enforcement, and ratification of international treaties.